Bratislava Slovakia (Slovak Republic) is a picturesque city located in Eastern Europe. It has many interesting landmarks and tourist attractions. Bratislava is the capital and largest city of the Slovak Republic (Slovakia). This pretty town is located on the banks of the Danube River. Bratislava is just one hour from Vienna by car or train. Many visitors travel to the Slovak Republic by boat from Vienna Austria or Budapest Hungary. Inexpensive flights are available to the Bratislava Airport from many cities. 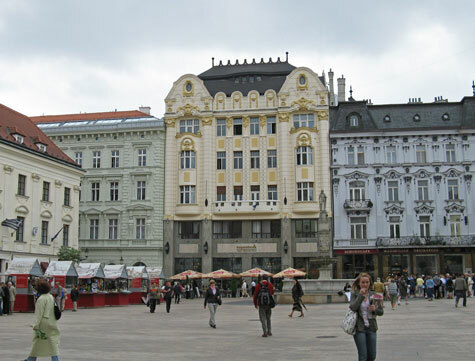 Great hotel accommodation can be found in the Bratislava city centre around the "Old City". Accommodation is also available near Bratislava Airport. Popular tourist attractions in Bratislava Slovakia include the Grassalkovich Palace, Bratislava Castle, St. Martin's Cathedral and the Old Town.